GET THIS RECIPE ON PAGE 32. IT'S EASY TO SPOT THE DIFFERENCE. IN SEASON ... Strawberries Cantaloupes Cucumbers Tomatoes Corn Beer & Wine And more! Just about every grocery item manufactured in Arkansas can be found throughout our stores. EDWARDS FOOD GIANT LIKE US! AND GO TO OUR WEB SITE! Heifer USA works with small-scale farmers and farmer-owned cooperatives in Arkansas to revolutionize the way people produce, sell and eat their food. With increased access to technical support and reliable markets, these farmers are using sustainably produced, local food to provide for their families and ignite change. Now accepting artisan vendor applications. Come shop more than 125 Arkansas artisans and craftspeople! Saturday, May 18, 2019 10 a.m. to 5 p.m. War Memorial Stadium in Little Rock Tickets at the door: $5 Stop by the Smithwork’s Vodka Lounge to enjoy a sample of Blake Shelton’s signature cocktail, the Smithworks Lemonade. We are committed to telling the story of row crop agriculture in Arkansas. We advocate for farmers and agricultural businesses to ensure the continued success of our great state. 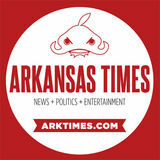 An Arkansas resource for Arkansas farmers. 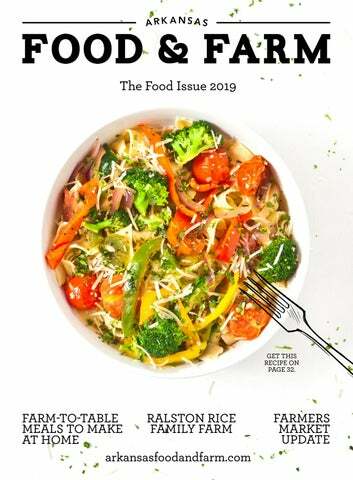 SPRING HARVEST ISSUE - MAY 2019 SUMMER HARVEST ISSUE - JULY 2019 FALL HARVEST ISSUE - AUGUST 2019 Contact Katherine Daniels with story ideas or advertising opportunities at katherine@arktimes.com. Dominica is the jenny and her baby is Tristan. unny days had been as rare as snow in Miami, so when the sky cleared about an hour before sunset, I found myself, bourbon in hand, perched on my hillside swing overlooking 20 acres of pasture. My mother is buried close by and sometimes I like to imagine she has the best farm view of us all. The pasture rolls out for a quarter-mile, boxed on three sides by limestone bluffs, a wetland forest and Bayou Meto. Off in the distance I could see our 25 sheep grazing in the second paddock accompanied by four guard donkeys. We have had more coyote or wild dog attacks on our sheep this fall and winter than we have ever had. The paddocks are surrounded by electrified wire but unlike years past, the wire has not stopped the animals from bursting through and tearing apart six sheep over the past few months. My ex-wife and I still farm together and she called me the other Saturday while I was at the farmers market in Hillcrest. She had come across a great deal, she reported. Donkeys are known to be great guard animals for sheep and she had found two for $500. The owner promised that the donkeys would not only kill coyotes and dogs, they would kill your cat if it wandered into the paddock. Well, I couldn’t resist that sales pitch and $500 for the pair is about half price, so I told her to go ahead with the purchase. A few minutes later I received another breathless call. He was willing to throw in two more donkeys for just $100 each. I am now donkey rich, as they say in the country. I have a brown jenny, a 6-month-old baby that really is cute and two way oversized black and white animals that look much more like mules that donkeys. I called the former owner and asked him if these were not indeed mules and he swore they were donkeys. I can talk tomatoes all day but could fill up this magazine with what I don’t know about donkeys. So all I could do is take him at his word, though, if I didn’t know better, I could have sworn I heard him laughing after he hung up the phone. Directly the sheep noticed me on the swing and, assuming I was there to feed them, began walking single file, led by GQ, our ram, across two fields and up the hill to surround me. The four donkeys brought up the rear. Soon everyone was grazing on the standing hay around the swing, and I resumed my bourbon reverie. A moment later I was startled to feel a hot breath on my ear. I turned only to find myself lip to lip with the big brown jenny, and that is when I was kissed by a donkey. She brushed her lips across mine and then pulled her head back, hoorawing and curling her lips up to reveal a fine set of teeth and about six inches of red gums. She was laughing as only a donkey can. Pretty cute, I thought, and then paused wondering if I had lived alone too long. Lacey enjoys a salad at the farm-to-table Prestonrose Beer Farm. VISIT THESE FARMERS MARKETS DOWNTOWN FAYETTVEILLE SQUARE Saturdays: April - November, 7AM-2PM Thursdays & Tuesdays: April - Oct., 7AM-1PM Winter Market (indoors) at Ozark Natural Foods. Saturdays: December -March 9AM-1PM. A FOOD MARKET FOR LOCAL GROWERS AND PRODUCERS. Jack Sundell is a Little Rock restaurant legend. He and his wife opened The Root Café, which serves dishes crafted from Arkansas-grown produce, about seven years ago. It proved a winning recipe, and now, the couple has joined forces with Cesar Bordón and his wife, Adelia, and opened Dos Rocas last fall. Some of those connections include talent like Bordón. “He started at The Root and did an excellent job as the lunch kitchen man,” Sundell says. He recounts how he and Bordón would grab a beer a few doors down at Midtown Billiards on Main Street after work, eventually devising a plan to open a place where they were comfortable and the libations were varied and home-produced. “We talked about how fun it would be to have a place where we wanted to hang out,” he remembers. Perhaps a pool table and dishes featuring a South American flare, Sundell and Bordón agreed as they floated the dream. Bordón and his wife, Adelia, jumped at the chance and were happy to rely on his expertise. “Jack has an awesome reputation. We were blown away by his offer,” Adelia says about the joint partnership. The couple saw this is an opportunity for Bordón to fulfill his dreams, and although Bordón works the open kitchen at the rear of Dos Rocas most days, Adelia held on to her day job at Heifer International as a Resource Development Associate. A LATIN FLARE Even though Sundell had his Arkansas produce connections through The Root and he’d already gone through the process of opening a restaurant, he says rather matter of factly, “There have been a few bumps, but we just work through them.” Already there were places serving up Latin flavor, like Rosalinda’s Restaurant in Levy and Local Lime in West Little Rock, but none close on Main Street. Plus, it was the perfect time because SoMA was booming and there were few remaining vacant storefronts. And while they’ve only been open about four months, Dos Rocas has a growing fan base, like John Hofheimer, a longtime downtowner, who says he recommends the yuca fries and the guacamole dip, made with fresh cilantro and lime. Harvesters bring in the crop. Nature’s Blend is a cross-pollinated blend of exotic and traditional rice. There was only a 3 percent chance of this rice crosspollinating, as rice is self-pollinating. Supporting Arkansas Farmers through farm-to-table fare. Leftover sauce makes a great pizza sauce on homemade crust. whisk until well incorporated. Layer tomatoes, caramelized onion, basil, mozzarella and top with egg mixture in pie shell and finish top layer with sliced tomatoes Bake for 45 minutes or until middle is firm and set. Turn oven on low broil for 3 minutes to achieve an extra crispy top. Remove from oven and let stand for 10-15 minutes. Serve with basil chiffonade, balsamic glaze or shredded parmesan. Gnocchi makes a perfect base for this savory dish! caressing each ham hock with salt and pepper, ensuring that all sides are generously coated. Add the garlic and beer to the baking dish. Nestle the hocks, broad side down, in the baking dish. Roast for about 4 hours, just until there’s some color on the skin. Baste those hocks with the beer mixture every hour or so, checking to make sure they haven’t given up on themselves and fallen into the gravy. If necessary, add a bit of water to the base of the dish. Baste one last time, then bump the oven up to 425° for the last 10-20 minutes of cooking so that the skin becomes crispy and golden brown. Allow to cool slightly, and then consume with gusto! Superior Bathhouse Brewery | Serves 8 INGREDIENTS: 8 JV Bratwurst 8 rustic hoagie bun caramelized onions Superior Pale Ale Beer Mustard (Made from scratch from Superior Bathhouse Brewery Beer) DIRECTIONS: Slice 3-5 onions. In a skillet, heat 1 teaspoon of oil until shimmering. Spread onions in skillet and allow to cook, stirring occasionally for around 45 minutes. Heat a separate skillet to medium. Cook bratwurst on each side for around 4 minutes before reducing heat and covering for around 10 minutes, or until internal temperature reaches 160Â°. Toast buns, add bratwurst, onions and mustard. Enjoy! mushrooms make this even better! INGREDIENTS: 1 Â½ lbs. stew meat 1 cup of barbeque sauce 1 cup of worsteshire sauce 1 cup of coffee liqueur 1 onion, sliced or diced 2 cups mushrooms (optional) butter DIRECTIONS: Place steak tips in a sealable container. Cover with liquids. Let sit in the fridge overnight. When ready to cook, put steak tips along with liquids in a skillet, cooking over medium-low heat for 10 minutes or until it achieves a good simmer. While the meat cooks, heat a separate skillet on medium heat. Melt four tablespoons of butter in the skillet. Add mushrooms (optional). Cook until tender. Serve over mashed potatoes. Top with mushrooms. A great meal for spring! DIRECTIONS: In a large, deep skillet or Dutch oven, brown ground beef, salt, pepper and garlic together. Cook until browned and crumbly, 5 to 7 minutes; drain and discard grease. Add cabbage, tomatoes, tomato sauce, liquid and bring to a boil. Cover and reduce heat, and simmer until cabbage is tender, about 30 minutes Adjust seasoning before serving. To make in advance, store in a large 9x13 Pyrex and reheat in the oven at 350° for 30-40 minutes. a gas range, take the pan off the flame before this step as you risk catching a flare-up. If using lemon, use water. Add reduced braising liquid and lamb at this point. Let it reduce slightly. Add pasta and a nice chunk of butter. Once the butter is fully emulsified into the sauce, finish with salt, pepper and some lime juice. This dish is beautiful when finished with some fresh chopped herbs and topped with some grated Parmesan cheese, and will pair well with a fuller bodied red wine such as a Cabernet Sauvignon. DIRECTIONS Preheat oven to 375°. Combine the flour, salt and baking soda in a small bowl. Set aside. Combine remaining ingredients except chocolate chips in a bowl. Using a hand mixer, blend together. Add flour mixture a little at a time and incorporate with a spoon, stirring by hand until incorporated. Stir in dark chocolate chips. Spoon out and bake for 9-10 minutes. Serve hot. while they are warm, DIP Em' in fresh milk! olive oil is your friend! drizzle it! Emerald Basmati with Basil Ralston Family Farms | Serves 8 INGREDIENTS: 1½ cups Ralston Family Farms Basmati Rice Kosher salt 1 small avocado, peeled, pitted and coarsely chopped 1 cup packed fresh basil leaves 1 lemon, juiced 3 tbsp. extra-virgin olive oil ¼ cup water 2 zucchini (about 1 inch diameter) DIRECTIONS: Bring the Basmati rice, 3 cups water and a pinch of salt to a boil in a medium saucepan over medium heat. Reduce the heat to a gentle simmer, stir, cover and cook until water is completely absorbed, 15 to 18 minutes. Remove from heat and let stand, covered, for 10 minutes. Meanwhile, put the avocado, basil, lemon juice, oil and ¼ cup water in a blender and puree; season generously with salt and pepper. Add more water and puree until the mixture is the consistency of sour cream. While you are waiting for the rice, in another pan, lightly coat olive oil and add zucchini until tender Fluff the rice with a fork and gently fold the green dressing and zucchini into warm rice. Serve. pair this with the foccia bread on page 30! Conservation Districts assist landowners in rural and urban areas. To reach your local conservation district, go to www.aracd.org or call 501.904.5575.
is a unique blend of 13 ingredients that is good to use on anything you would normally salt and pepper. Look for it in your local grocery stores! Borage flowers are known for their supposed moodimproving qualities. pring is poised to rush in with full floral regalia: dainty blue borage garnishing cocktails, nasturtium petals lending their colorful pop to salad mixes, fresh lavender and more. Edible flowers add style and flavor to dishes and are increasing in popularity among chefs and eaters alike. Eating flowers may seem like a zany modern concept for fancier food photography, but it’s been around for a while. During the Great Depression, the children of struggling families were dispatched to public parks across New York City to pick dandelion greens, a nutrient-dense wildflower that is more and more a luxury item in today’s food economy. Many growers are focused on decorative flowers, so acquiring these delicate edible florets is no easy task. The buds do better in the cool spring weather and can suffer in the heat of a farmers market stand. Restaurants are the best source. “Chefs use them as garnishes mainly, for desserts and cocktails and some on salads, too,” says Kim Doughty-McCannon of Bell Urban Farm in Conway. “They are more of a luxury item for restaurants to buy, I think.” Jay Fulbright, of Arkansas Natural Produce (ANP) in Malvern, grows a variety of edible flowers: nasturtiums, borage, Bachelor’s Buttons, marigolds, dianthus and snapdragons. “It’s a niche, small market,” Fulbright says. “It’s not economical unless it’s part of a mix.” Find their flowers at the Arkansas Local Food Network in Little Rock or the Spa City Market in Hot Springs. ANP’s primary focus is greens, and that’s the economical mix Fulbright refers to and a tactic shared by Bell Urban Farm, whose salad greens are known to pop with the color of edible flowers in spring. use is likely in a fresh tea infusion. The flowers may also be dried and stored as a seasoning. A bit more of a challenge to grow in the South, lavender should be planted in partial shade and kept consistently watered. Propagate with cuttings in the second year of growth. Pea blossoms, which taste much like the peas they eventually bear, give any dish they’re applied to a charming appearance. The flavor, however, may best be suited to savory dishes. These might be found at local farmers markets but are more commonly sold to chefs. German Chamomile, a very productive and somewhat invasive plant, will reseed itself year after year and practically grows with no involvement from the gardener. A handful of pretty little chamomile flowers puts off an invigorating scent that is strikingly similar to fresh-cut green apples. The flavor, however, is, surprisingly, rather bitter. Most commonly used in teas, some do add the flowers to salads. Pairs well with lavender for a relaxing evening brew. The purple conical clusters of hyssop flowers smell sweet and syrupy and are somewhat astringent (they’ll numb the tongue a bit) with a flavor like that of licorice. It is not unheard of for these flowers to be boiled and lightly sweetened into a palatable cough syrup. As a dried tea, hyssop works well during cold season to coat a sore throat and ease coughing. The plants are lowmaintenance, perennial and provide up to three harvests each year. All of the edible flowers not mentioned here could—and have— fill volumes. Rose petals have not been mentioned, nor peonies, saffron, elderflowers, passionflower, apple blossoms and so many others. To continue the conversation in an online community focused on edible flowers and recipes, like Flower Ice Pops and Spiked Blackberry Lilac Lemonade, seek out the group, “Edible Flowers,” on Facebook. For more specific recipes, there are a great number of recipe books focused on edible flowers and an infinite variety of ways to brighten any dish this spring. WHAT TO EXPECT AT THE FARMERS MARKET IN 2019 Spring is just around the corner, and with it will come patio weather, outdoor gatherings and, of course, the farmers market—crisp mornings spent browsing stalls and chatting with growers, rediscovering old favorites and finding new items to look forward to. FLOWERS One of the most exciting sights at the market is stalls exploding with cut flowers. And this year, look for edible additions that will add some visual excitement to your plates. MUSHROOMS White button mushrooms are great and all, but your mushroom game can be improved. Look for Lion’s Mane, shiitake and oyster mushrooms. MICROGREENS Microgreens have been rising in popularity over the last few years. These are best enjoyed in the still-cool spring, before it gets too warm. Enjoy as a salad, on a sandwich or cooked into an omelet. MEAT Remember when items requiring cold storage couldn’t be found at the market? Times have changed. Come to the market for beef, chicken, pork and lamb from local farms. COFFEE It seems a new coffee roaster comes along at least every few months—and Arkansas is the better for it. Look forward to a few newcomers along with the faces you’ve come to expect. OTHER HOMEMADE AND HOMEGROWN GOODS Remember, the market isn’t just fruits, vegetables and meat. Pick up your week’s supply of bread, honey and dog treats, along with hand-carved signs and more.